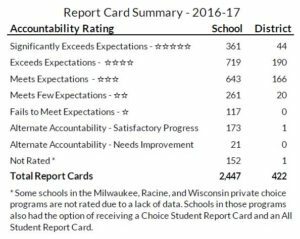 Annual report cards released by the Department of Public Instruction show the majority of Wisconsin’s schools are performing well. The DPI says 82 percent of the public and private schools in Wisconsin had three or more stars out of a possible five, meaning they meet or exceed state expectations. A total of 378 schools and 20 districts scored two stars or less. Another 173 schools made satisfactory progress on improving their scores from last year. This is the second year for the report cards, which are based on a variety of factors – such as student performance in English language arts and mathematics, along with graduation and attendance rates.